This is Li Shiang Dan who is going to submit some articles occasionally on this weblog. 오늘부터 가끔씩 블로그담당을 맏게된 이향단입니다. I came from China this November, this New Year is the first one for me to spend in Japan. 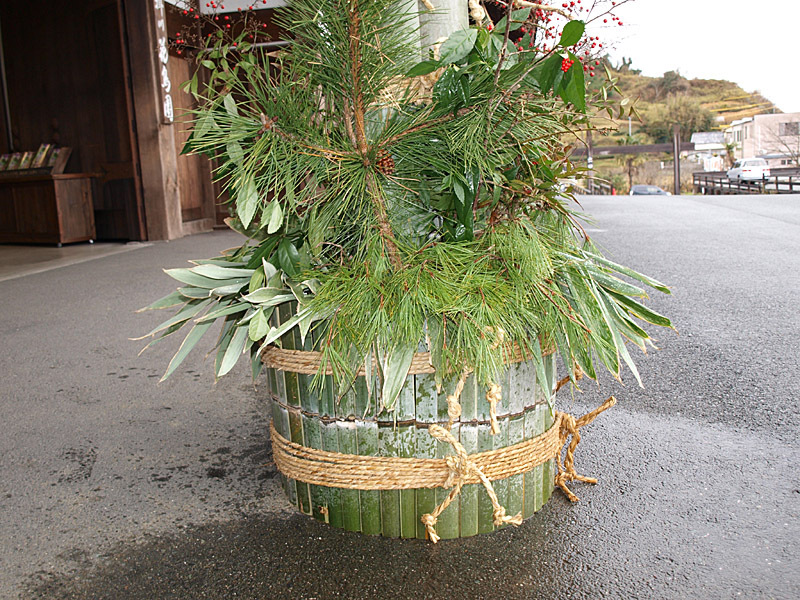 I'm impressed with some Japanese decorations for new years, so I'd like to focus on them with pictures I took. 11월에 중국에서 일본으로 와서 처음으로 원단을 맞이하게 되였습니다.일본의 정월장식을 보고 흥취가 있어 사진을 찍어 보았습니다.사진기술이 좋지는 못하지만 너그럽게 봐주셨으면 감사하겠습니다. This picture, taken on December 28th, shows Kadomatsus and Shimenawa decorations. 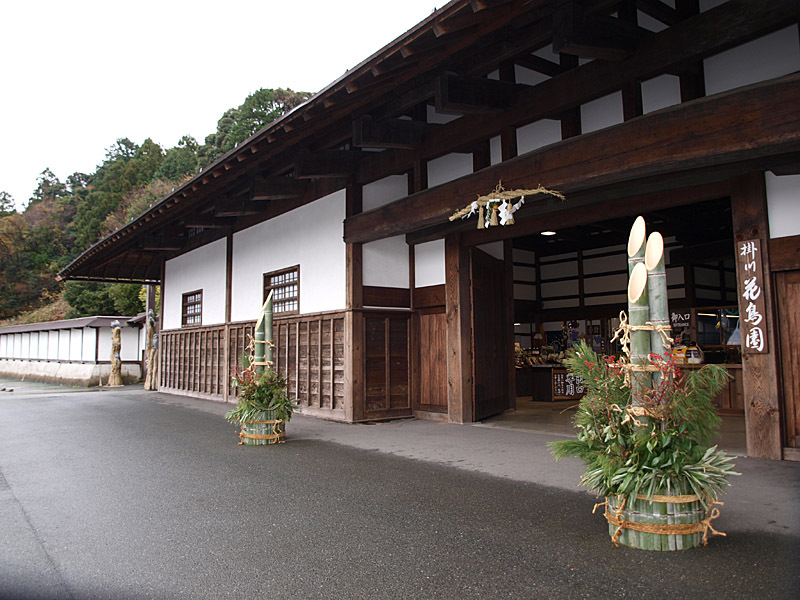 Kadomatsus are made of bamboo canes and pine branches in a pair and placed on either sides of the entrance. 사진은 12월28일 나가야문앞에서 찍은 카도마쯔와 시메카자리입니다.카도마쯔는 대나무와 송 등으로 한쌍씩 만들어 대문 양쪽에 장식합니다. The ground was wet that day due to rain in early morning, but wide eaves blocked the rain in a zone near the wall. You can get off the car without getting wet even on rainy days in this area. 아침에 비가 내려서 땅이 젖어 있었는데 폭넓은 나가야문의 지붕때문에 비에 젖은 지면과 젖지 않은 지면사이에 선명한 분계선이 생겼습니다.비가 내리는 날에도 지붕안쪽에서 차를 내리시면 비를 맞지 않고도 화조원내에 들어 가실수 있습니다. A closeup of the top of a Kadomatsu. 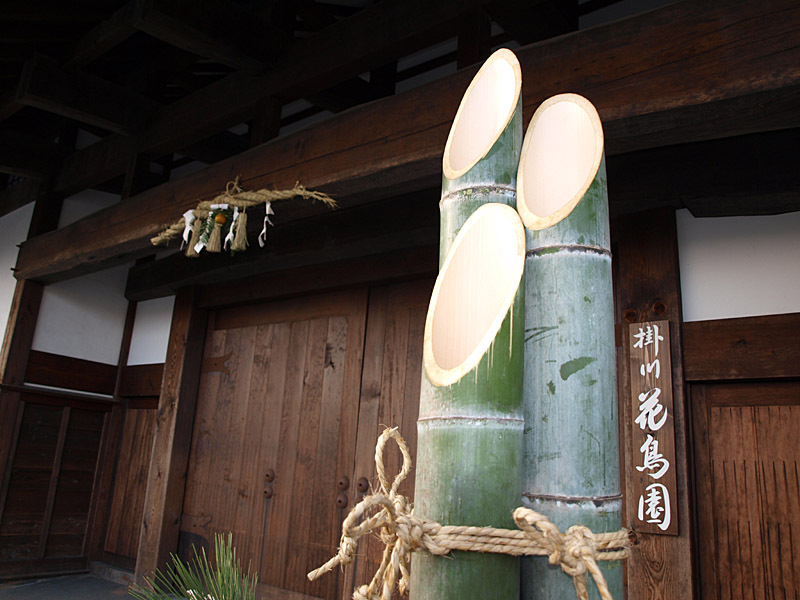 Three bamboo canes, that are cut slant to form a single slope, are tied with ropes. 위의 사진은 가까이서 찍은 카도마쯔의 윗부분입니다.3개의 대나무를 한데 묶어도 윗부분이 한평면으로 되도록 베여 든든한 끈으로 꽁꽁 묶어놓았습니다. 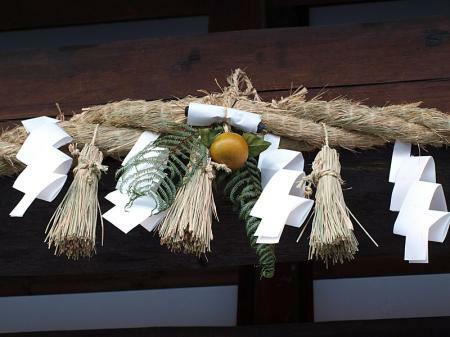 Lower decorations of Kadomatsu, covered with two rings of bamboo plates that are tied with ropes. Fresh pine branches and Nandinas are also seen. Nanten, Japanese translation for Nandina, is the homonym with a phrase meaning "removing disaster", making Nandina regarded as a lucky plant. 이것은 카도마쯔의 아랫부분입니다.두층의 대나무로 둘레를 감아서 풀리지 않게 끈으로 고정시켜 놓았습니다.다음 송,남천을 꽂아 장식하죠.남천은 일본어발음으로 <어려움(난)을 뒤집는다(전)>와 같은데로부터 장식하게 된 것이랍니다. 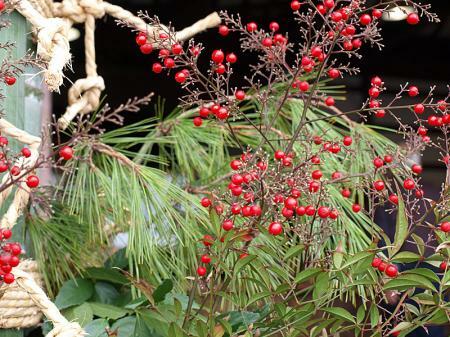 A closeup of Nandina berries, cute like Cherries in front of green pine branches. 이것이 남천입니다.푸른 송을 배경으로 한 앵두같은 남천이 참 귀엽죠. I saw Ms. Inaba, a receptionist, watering Kadomatsus. 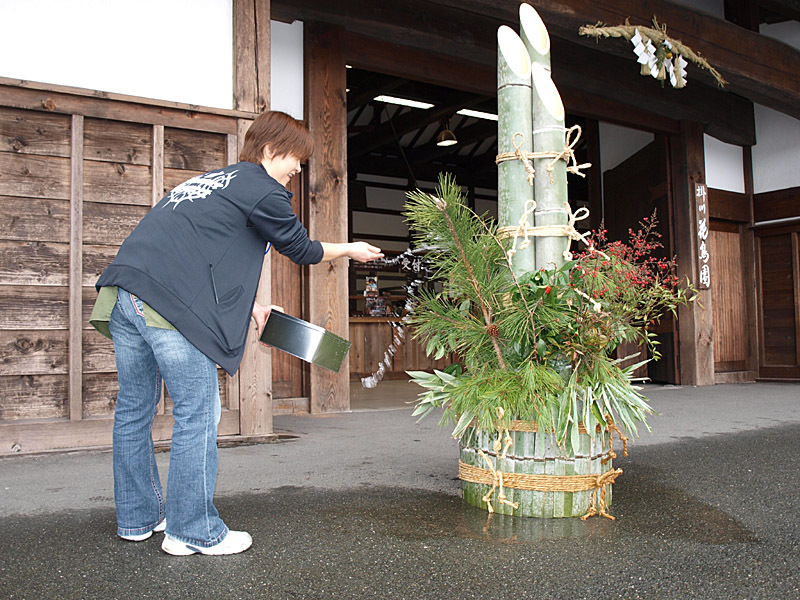 The staff members in Kakegawa Garden water Kadomatsus every morning to keep them vivid, for the decorations are placed from late December to early January. 마침 카운터의 이나바씨가 카도마쯔에 물을 주고 있었습니다.물을 주다니? ?아직 살아 있는건가?! 그렇습니다.카도마쯔는 아직 살아있는 생물이였습니다.12월말에 카도마쯔를 세워 1월상순까지 장식하기 때문에 카케가와화조원에서는 매일아침 물을 주고 있습니다. A shot of Shimekazari. Usually it is placed by period from Christmas to December 28th. A thick rice straw rope is decorated with papercrafts and straws, and a set of Gleichenia fern foliage and a Mandarin Orange is set on the centre. The orange stands for a wish of prosperity of descendants. 마지막으로 시메카자리의 사진입니다.대부분 크리스마스부터 12월28일사이에 걸어 새해를 맞이한다고 합니다.보기좋게 묶은 벼짚에 풀고사리,접은 좋이,벼짚걸이를 장식했습니다.풀고사리를 거는 유래는 알수 없었지만 귤(다이다이라고도 함)을 거는 것에는 대대로 자손이 이어가리라는 소원이 담겨져 있다고 합니다. You can see from the first picture that the horizontal rope of Shimekazari turns thinner at its both ends. 이 사진에서는 알아보기 어렵지만 한장 위의 사진을 보시면 옆으로 되여 있는 벼짚이 가운데가 굵고 양쪽이 가늘다는 것을 알수 있습니다. Though only small Kadomatsus are seen on ordinary Japanese houses nowadays, Kakegawa Kachoen prepares for the coming year with huge Kadomatsus in front of Nagayamon Entrance. In China, instead of Kadomatsu and Shimekazari, Chunties are stuck on either sides and above the gate on New Year's Day of lunar calender. Chuntie is a sheet of red paper with a wish written on it, usually in four chinese characters. 지금 보통가족에서는 작은 카도마쯔를 장식하는게 대부분인데 카케가와화조원에서는 매년년말이 되면 스탭들이 나가야문앞에 커다란 카도마쯔를 세워 새해를 맞이하고 있습니다.중국에서는 원단에 카도마쯔를 장식하는 습관은 없지만 설날에 문 양쪽과 위에 춘련(春聯)를 붙입니다.춘련은 빨간종이에 양쪽에 같은 글자수로 소원을 담은 문장을 쓴 것입니다.위의 문장은 4글자로 된것이 대부분입니다.